Unlike with most of my other personal reviews on this site, this one will focus on the actual production of Mozart!, not just the cast album. Since I've actually seen this show, it made more sense to talk about what's onstage than limit myself to the CD. My comments apply to the show as it was in mid- to late-November 1999; I know some changes have been made since then. Many thanks to the people, those I don't know in addition to those I do, I've discussed it with, however briefly, for helping me to clarify my opinions regarding just what is wrong with the show: namely Alexandra, Ursula, Iris, Lisette, and particularly Jörn. I say "what is wrong with the show" because there is, quite frankly, more wrong than right about it. It has potential, but at this stage I fear that potential will never be realised; while they're still working on it, and from what I hear no one is under the illusion that the show is "complete", I suspect that they'd have to toss out most of the current version and go back to the beginning in order to really get anywhere. There's some nice music, some good performers, beautiful costumes....but it's not cohesive. Structurally, I think the show's a mess. There are too many times when it feels like a bunch of random scenes strung together; where one scene just ends and another begins, without either an applause moment (which is fine, there shouldn't be applause after every song in a through-sung show) or the first scene flowing nicely into the second; where the characters tell us what's happening to them rather than showing us; where....You get the idea. While it may not be literally true, looking back it feels like there are too many solos, not enough scenes involving multiple principle characters. Not to mention a random song about the French Revolution, which has nothing to do with anything else in the show, solely because "it's Harry Kupfer; there has to be something political". And then there's Schikaneder's song, which is certainly well-performed, but stylistically comes out of a completely different show. It's also hard to follow the timeline. Ignoring the prologues to each act (since they take place long after Mozart's death), the only character who clearly ages at all during the show is the transition from the first scene to the second, where the child Amadé ceases to "exist" for the other characters, and the role is taken over by the adult Wolfgang. According to the program, nine years pass between these two scenes, yet Leopold, Nannerl, and (when we see her again a bit later) the Baronin von Waldstätten look, move, and sound the same before those years pass as after--not to mention for the remaining 20 or so years the show covers! Of the nine or ten performers I saw in principle roles, none of them seemed to make any effort to indicate changes in their characters' ages. To be honest, the only way I could tell that time was passing the first night I saw the show (before reading the program synopsis) was by the aristocratic ensemble costumes and my vague recollections of what I learned in a costume design class I took in college regarding 18th-century clothing. Another thing I didn't like was the feeling that they expected their audiences to be too stupid to understand metaphors without having them spelled out for them. I had been warned before seeing the show that the end, Wolfgang's death, was like that, even though the concept--that Amadé, Mozart's "genius", his music, was slowly killing him--had been portrayed clearly in the act one finale. Under the circumstances, the dialogue for the death scene (particularly "ich bin ausgeblutet") was unnecessary. (Then there's those big chords every time Amadé stabs Wolfgang, straight out of a horror movie.) Since I was aware of that going in, it didn't bother me quite as much as it might otherwise have, though it's still an issue. What made me feel like I was being talked down to was towards the end of Mozart, Mozart! (a song I otherwise like), when they brought out the giant balloons with his face on them, sunglasses, flash cameras, etc. As if there were no other way to make the audience understand that he was hugely successful and widely known than by blatantly imitating the reactions generated by today's celebrities. Speaking of anachronisms, there were some in the designs that bothered me as well. I was able to accept having Wolfgang in more modern costumes, but things like the Webers' truck and neon sign and all were just too much. And while having "postcards" crossing the stage to illustrate Colloredo and Arco's passage on their way to Vienna was moderately cute at first, it grew annoying very quickly. On the other hand, I liked several of the cast members. The nicest surprise for me was Lenneke Willemsen (Baronin von Waldstätten); I'd seen her name in the ensembles of other casts, but had never really heard anything about her. She was marvellous. I was also very pleased with the understudy Constanze, Judith Jakob; unfortunately, I only saw her once. She looked, sounded, and acted much sweeter than Ruth Brauer (whom I saw three times); doubly important since we're never shown why Wolfgang falls in love with her, only told that she's wonderful. You just have to take it on faith, and that's considerably easier with Jakob than Brauer. I also liked Thomas Borchert, though he, too, only performed one of the nights I was there. Jörg Westerkamp was okay, but his voice isn't as strong, and he lacks Borchert's stage presence. 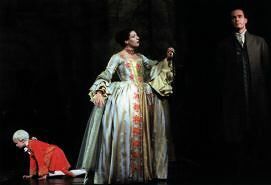 Neither Caroline Vasicek nor Birge Funke was particularly impressive as Nannerl; their acting was similar, but both had weak voices compared to, well, everyone else in the cast. Funke's was a bit better than Vasicek's, particularly on the first night I saw her, though I would have liked to have seen the third cover for the role. Which leaves two. Uwe Kröger was brilliant, every time I saw him--and thankfully I never got his understudy. His role wasn't exactly a challenge for him, I don't think, but it was certainly enjoyable. As with Sunset, however, what I found most impressive was his acting (well, and the final "und dem Zauber der Muuuuuuuuuuuuuuuuuuuuuuuuusik!" in Wie kann es möglich sein; his upper range has improved tremendously over the years! ); every moment he was onstage, whether the focus of the scene, part of the ensemble, or even mostly hidden from view (such as before his entrances for Wo bleibt Mozart? and Ich bleibe in Wien), he was completely in character, every inch the arrogant prince. In his main scenes, particularly the two where a lot of other cast members are also onstage, the instant he entered the scene your attention was drawn to him; not by anything he did, really, but simply by his charisma. Suddenly there was not just one more body there, but a real presence. Unfortunately, Yngve Gasoy Romdal doesn't seem to have any charisma; I'm not the only one to think that he's overshadowed by not just Kröger, but Borchert as well. He's no match for them vocally, either. I don't recall ever hearing anyone say they liked his voice (though he does have a few good, strong high notes scattered throughout the show), but a lot of people have told me that his acting in various roles made up for that. Sadly, I can't decide if that's true for me; one of the reasons I'd hoped to see Rob Pelzer as Wolfgang at least once was so that I'd have someone to use for a comparison, which might have helped solidify my feelings about Gasoy Romdal. Unfortunately, the one time I was supposed to see Pelzer was the night the show got cancelled after the first scene....*sigh* But back to Gasoy Romdal. He's certainly extremely energetic, but he doesn't really seem capable of carrying this show. A truly dynamic Wolfgang might have made the other faults less...disruptive, though I doubt it could make them disappear entirely. To be fair, he's working from a rather handicapped position--as was pointed out to me, he's asked to sing all these solos that never go anywhere. They don't build to anything; instead, they hit their peak at the end of act one with Wie wird man seinen Schatten los (generally agreed to be one of the best songs of the score), leaving most of act two to be rather disappointing. Dich kennen heisst dich lieben joins the list of other bland love duets like A Heart Full of Love from Les Misérables, his bit in the middle of Mummenschanz is rather unmemorable, we've already heard Warum kannst du mich nicht lieben in the beginning of the show....The audience's expectations are raised, then never met. And I'm not sure that even the best of Wolfgangs could overcome that. As for the CD, I found it generally a tad disappointing. Some performers--specifically, Gasoy Romdal, Vasicek, and Brauer--sound a bit better here than they did live; others, like Kröger and Borchert, were definitely better in the theatre. As a whole, the CD lacks the energy of the live performance, and the tempos seem a bit slower. What I like least about the cast album, however, is the mixing. The ensemble's too loud under Kröger, Borchert, and Gasoy Romdal in Wo bleibt Mozart?, for instance, and Mozart, Mozart! is just dreadful. It hardly sounds like the same song on the CD as the one that sent shivers up my spine in the theatre....There are a couple of minor typos in the lyric book that I found amusing: apparently for the recording Leopold was played by Thomas Bochert, and in the reprise of Wie wird man seinen Schatten los? it says "Uwe" instead of "Colloredo". Yes, I'm easily amused by things like that. Am I sorry I saw the show? Certainly not. I'm not even sorry I saw it multiple times, really, though I probably would have stopped at two had I not been hoping to catch Borchert and Jakob again, and Pelzer at least once when there was an actual, well, performance. Still, it's a far cry from Elisabeth.